I’m at the Best Friends Forever Conference in Pennsylvania, taking a quick break from the talks. I have to say that this is one of the best seminars I’ve attended: the quality of the talks is outstanding. Suzanne Hetts gave one today that was fantastic: absolutely the best organized and most informative talk on what dominance is and isn’t that I’ve heard. I couldn’t begin to summarize it all, but here is some especially useful information from it, based on common mythologies that people have about dominance. I. Most (all?) interactions between dogs are competitive (going out the door first, who gets the toy, etc.). Is this true? No, it’s not. The fact is, many interactions between dogs are not competitive. A great example is the tug game. Some people argue that you have to ‘win’ or the dog won’t respect you, yet many dogs love to play tug for the sake of playing tug and will give you back the toy if you drop it. Suzanne showed a video of one of her dog repeatedly giving the toy back to her husband, Dan, clearly in hopes that he would continue the game. That’s exactly how Hope plays with me BUT not how he plays with Willie. I don’t think Hope is “playing” tug with Willie, I think he simply wants the toy for himself. He grabs it closer and closer to Willie’s mouth, and if he gets it he takes it away. However, Willie and Lassie played tug for long periods of time, both holding only the very end of the toy, giving it back to one another if necessary. Conclusion: some interactions may be competitive, but lots and lots of them aren’t. II. Dominance is about Control and “Obedience.” The confusion between ‘dominance’ and ‘obedience’ is pervasive, but they are NOT the same thing. “Dominance” is about who wins a competitive interaction over something that both individuals want, not about responding to a cue or “command.” Calling your dog to come has absolutely nothing to do with ‘social dominance,’ whether the dog comes or not! Confusing those concepts has caused a lot of problems in the dog training world, not to mention to lots of dogs. III. All dogs are social climbers and are always ready to challenge others (humans or dogs) for social rank. Not true again. First, many people argue reasonably that we know little about “dominance” between 2 species. As used in science, it is between animals of the same species. Second, Suzanne argued, that if anything, most domestic dogs are predisposed to take a subordinate role to humans. We could talk about this aspect for hours (and pages), but she made several excellent points in relation to it. If this hangs you up, ask anyone if they would take a real bone away from a wolf. And as importantly, it is simply not true that all animals of a social group “want” to be high ranking. There are many costs to being in a high social rank, and many benefits to being a subordinate. IV. Some dogs are just “dominant.” Whoa, careful here again. Dominance is a descriptor of a relationship, not a personality or an individual. If you have 2 individuals and a piece of food between them that they both want, one individual would be described as “dominant” if he or she gets the food 20 out of 20 trials. That’s all the concept meant as it was and IS used in science. What’s often not considered by the general public and advocates of “getting dominance” over your dog, is that it is context dependent. Indiv A might get the bone every time, but Indiv B might get the sleeping place. Motivation and context is everything, and behavior in one context does NOT necessarily predict behavior in another. I could go on, but better get back to the conference. Most importantly, Suzanne did an excellent job of advocating for people in the dog world to be able to talk about the concept knowledgeably, to avoid polarized conversations that only divide and confuse, to use terms with precision and knowledge, and to avoid repeating assumptions. She advocating for people on both ends of the extremes on this issue to take a deep breath (my words) and educate themselves about what science tells us about social relationships. Here here. 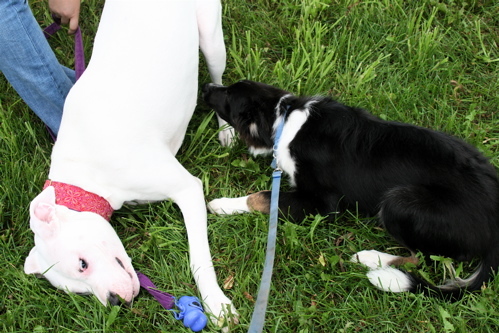 Before I go, here’s a photo I took the day before I left, of Hope’s new friend, Lily, a young Dogo Argentino (sp? ), who tends to lie down every time she meets puppies and young children. Clearly she is trying to exert her dominance here! Lily and Hope couldn’t play, because she had just had minor surgery, but I suspect rollicksome play is in their future. « Do Dogs Recognize our Facial Expressions? Is this conference video taped? Are transcripts available? AWESOME! I see only a “dominance” issue with one of my dogs – and I call it a “boss” issue, the responsibility of which I am trying to relieve her. She will be perfectly happy when she finds her only dog or one other dog home :). I can’t wait to hear more! Excellent information. The biggest appeal of dominance for humans, in relation to their animals seems to be the misconception that once established (and maintained through “refreshers” now and then) it will give the human “the keys to the kingdom.” People seem to be under the impression that it’s all or nothing: if they have dominance, all their dog behavior problems will be solved, the dog will automatically know what the person wants and do it, because he has submitted to the human. This is the “unspoken message” I hear over and over. In the dog world AND in the horse world. Yup! Dominance is the hot button issue with horses, now, too. Thank you for these clear points to help de-bunk misunderstanding. The first point you cite – about interactions being competetive, is such a huge irritator with me, because if the interaction is thought of as competetive, well, someone ‘has’ to ‘win’ because that how humans evaluate competitions. An interaction with your dog, or other pet, or any animal, will be more successful and less stressful – hey, even fun – if people just grasped that in almost every case, they have resources that animals want, and that giving those resources in a friendly way will be good for both parties. Jealously hoarding resources unless an animal reads your mind and does what you want, or withholding resources because the animal can’t figure out what you want, just makes you a selfish jerk – not the ‘dominant winner.’ Sadly, I hear about and see interactions like this way too often. I love the picture of Lily and Hope. My Borzoi,Lexi greets all other dogs by laying down and making herself as unthreatening as possible. She is very large and tall compared to almost all other dogs we meet. Her main goal in life is to play with everyone so this posture is all a prelude to asking for play! Trish, that was an awesome summary of that talk!!! Glad you take better notes than I do. What Trish is not mentioning and I will – is that she did a FABULOUS talk about emotions and another great talk about Play. One of the most interesting things about her play talk was watching how people try to initiate play between dogs, it was comical and educational at the same time. In addition to showing the unsuccessful attempts, she illustrated through video, the effective approaches. What a difference! I’m looking forward to a lot more play sessions with Daisy in the near future. Trish – thanks again for the picture and the book signing – it was an honor to meet you. look at the smile on Lily’s face. What a sweet dog she looks like. Yes, Dr. Hetts is awesome!! I always enjoy her stuff. I was bummed not to be able to go! But hey, you’re obviously wrong about the Dogo puppy- don’t you know they are “dominant breed?” Just kidding! I hear it all the time, people mentioning that they need to “get dominance over” their “dominant breed” puppy, makes my skin crawl sometimes! Ok, I was too shy to introduce myself but I was the one knitting in the back row! What an informative time listening to both you, Dr. Hetts and just soaking up information around me at today’s conference. I could just do this one day and as an “outsider” a.k.a. first time puppy owner, not a professional dog trainer, it felt very real and important. I now know the exhaustion of mental vs physical stimulation firsthand as I am exhausted but oh so inspired! Interesting series on dominance. I certainly recognize my own knee-jerk reaction to the idea of dominance, special thanks to Cesar Milan, but at least I recognize and am critical of this!! I’d really like to hear your thoughts on overlap/similarities/differences/etc. of resource guarding and dominance within a relationship. What makes me think of this is the behaviour of my recently failed foster, Elsie (it was bound to happen!). What I think I’m observing is her guarding her leash, primarily the end of it. When I took her in as a foster I left her leash dragging for a couple of days. I would find that if one of my other dogs approached (walked by, etc) she would seek out the end of her leash and stand stiffly and buggy eyed over it. I then left her leash hanging by the front door. She doesn’t seem to do with with my hound, but when my 15yo “crazy old lady” walks through the doorway near where the leashes hang, Elsie immediately and stiffly rushes over and stands in the same posture between Max and the leashes. She has lifted her lip once, but will for the most part will assume a stiff legged, curly tail (it only curls tight when she’s aroused), buggy-eyed frozen stance, staring usually at the ground under the leashes. Max will usually continue with whatever she was doing, usually standing and looking around or walking a bit. She doesn’t appear to take heed of Elsie. Elsie has never escalated beyond this, though I will always jump in and move one or both away from each other/the area. So to use this situation as an example, I am wondering how it might be assessed. Perhaps Elsie finds Max “weird” (she is a little), and therefore stressful, which causes some guarding behaviours to pop out? Or is this perhaps related to dominance, Elsie finds her leash to be a valuable and scarce resource that belongs to her? If the latter is the case, is this a sort of ‘one sided’ relationship of dominance? and can that exist? Max doesn’t appear to notice what Elsie is doing, though perhaps she just doesn’t care. Or doesn’t understand the intent. Max toddles around and gets stuck in corners (mild canine cognitive dysfunction), so it’s hard to tell what’s going on in her mind sometimes. Can Elsie’s claim of the resource really exist in a relationship of dominance when the other party (Max) doesn’t comprehend her role within that relationship? Of course, I’m speculating here about Max and how she understands it. Of course, this is just a sliver of their relationship, and there would be much more to assess for a clear picture. But regardless of my own situation (I thought I’d use it for illustration), I am interested to hear your thoughts on the topic, should you care to express them!! I’m looking forward to your lecture here in Toronto next weekend! Wow, that sounds like it was a great lecture! I can certainly see how dominance is both context related and relates to the motivation. My female corgi is obsessed with chewing and buying chewies like dino-bones have saved our furniture. 9/10 my male corgi will let her have the chewie when they are both eyeing the same one (with some whiney growls, sometimes, he’s very vocal). If however I bring home a brand new chew toy, I can guarantee a fight will break out if I’m not there to monitor him, since my male corgi LOVES anything that is new. His motivation goes up and he will not back off at that time. It’s nice to see this behavior be put in words by wonderful people like you and Suzanne Hetts. I have seen some tug o war sessions that were playful and some that were aimed at getting possession of the object and there is a huge difference in posture- the same stiffness seen in dogs that are about to fight vs. dogs that are playful. Generally the head gets still with staring eyes and if the other dog doesn’t back off with that the first one will inch his/her mouth up the object until the other dog does back off. I haven’t seen a case where both dogs are equally intent on getting it so it ends up in a fight. With the playful tug o war there is a relaxed, wiggling around, back and forth movement of both dogs, or dog/person. One time I was at the other end of a possessive tug o war when someone’s dog grabbed my jacket (with treats in the pocket) and was intent on stealing it, with the growl and hard eye, stiff posture and all that. With only reaction and not thinking what could happen I thunked her on the head and she let go. What the dominance people always fail to realise also is that when it comes to competing over food and such, it may also depend on who happens to be hungriest. A dog who is starving will fight more savagely to keep it that a dog who just ate. The dog who just ate probably figures that, at this moment in time, food has lower value in their quality of life than keeping the peace with the starving dog…whereas the starving dog needs that food much more to stay alive. People forget that dogs being a sociable species quite often put the value of relationships with other individuals above material resources…being able to carry on interacting with a certain dog and play with them adds more quality to their life than some ball they just gave up in favour of that other dog who just happens to like balls more for example. To them, it’s not worth fighting to keep a ball but losing the relationship with the other dog in the process…which they might view as more important than the ball. People make the mistake that dogs are out for the same things that us humans think they should like…dogs each all have their own idea about whats most important to them..and this usually doesn’t tally up with the human view of things quite as much as too many people think. Oh, I love it! What really opened my eyes to the relevance of dominance theory in dog-human interactions was the revelation that, among wild wolf packs, even the lowliest has a right to defend food already in his possession, even if the thief is higher ranking. That, along with the news that in large packs, subordinate males will sneak off to mate with breeding females while the alpha is off doing something else, made me realize that even among wild wolf packs, dominance is not the be all and end all. I also like the way you talk about how not all dogs are dominant in all situations. My male will nearly always win the race for dropped food; my female just gives up. Similarly, throw a tennis ball that more than one dog wants and my submissive female bows out of the contest. Since she really, really adores both treats and thrown tennis balls, I have to conclude that if she were more “dominant” she would at least sometimes challenge for these items. On the other hand, my bossy male dog will vacate the water bowl, no matter how thirsty he is, for both my more submissive female and for the 7-month-old kitten. We were on a warm-weather hike that left the dogs panting and scouting for water, and yet when we offered the bottle that both dogs wanted, the female shoved the male out of the way. Clearly water is not something he sees as worthy of pushing his weight around. He also could not care less about who goes out the door first and will make way for anyone for a walk. Going through a narrow space in pursuit of ball or in hopes of a treat is another matter altogether, and he’ll always win that race. Emily, what an interesting question! I don’t pretend to have any qualification to answer it in any but an anecdotal way, but I would chime in that I’ve seen this type of behavior also. In one case, my brother’s very affectionate dog attempted to position herself for optimum attention by squeezing in front of and lying down partially ON Otis, who was already settled comfortably. He growled at her, she never even glanced in his direction. After a moment, he shuffled over a bit and made room for her. In this interchange, only Otis expressed tension about sharing personal space and attention, but it was Sandy who a) claimed the better position and b) ultimately won the competition for that space. Was she actually oblivious, or was her lack of acknowlegement a subtle method of establishing status while avoiding aggressive conflict? Otis frequently ignores territorially barking dogs-outwardly he might appear to be fully absorbed in a leisurely sniff of the curb or shrubbery. I know that he sees and hears the dog and that he’s concerned about it-he’s actually ready to react at a moment’s notice if the dog breaks loose or charges at us, and he’ll often lift his leg on something nearby. But he won’t glance at the dog unless the threat becomes imminent. I’ve also seen many examples of dogs at the park who are intense about protecting resources that other dogs have no interest in-again the posturing and guarding behaviors are typically just ignored. As long as the guarder doesn’t cross the line into overt aggression, the other dogs just don’t seem to notice or care. Lastly, I have seen the phenomenon of dogs singling out an ‘oddball’ dog to ‘block’ from resources and human contact that they typically do not protect. Usually the target is a dog who is excessively nervous or timid around the others-I don’t know if it’s because these dogs seem like easy targets or whether it is a way of expressing the target’s exclusion from the ‘pack’ and thus access to shared resources and social activity. Typically the presence of the target dogs is tolerated but ignored. The secondary question that occurs to me is this: Will the dog displaying possessive/dominance behaviors ultimately de-escalate/abandon these bahaviors as a result of being ignored? Or will the lack of reaction prompt an escalation of intensity? Does this depend on whether the the guarder successfully protects the resource? P.S. I was also wondering whethe ignoring another dog can be a subtle form of claiming higher status? I’m with Karen. Will there be transcripts or a video to purchase of these two seminars? I’ve spent time on Dr. Hetts’ website, BehaviorEducationNetwork.com. There is a wealth of useful information and handouts to share with clients! I have found myself redefining dominance to clients and people I apprentice on a regular basis. Hopefully, little by little, we can spread the word. Oh Patricia, you are the best! This was extremely well-said. I have taken Suzanne Hetts’ Dominance webinar and I learned so much! I wish I could study social dominance in dogs to get a better understanding. I have several hypotheses and that I want to test, but need to align myself with an ethology program that won’t mind me staying in Tucson. Patricia, what a great conference. Thank you for all the great information. As dog training continues to become more “professional” it is nice to have research based training strategies. All weekend I was wondering however if it would be better to use and inductive approach to the science rather that the deductive scientific method. I particular, there were several discussion about cortosol. Pam pointed out that it is difficult to get good samples and the results were not consistent. It appeared to me that there was quite a bit of interpretation of the results to fit the hypothesis. I wonder if we would learn more by beginning with observation then drawing our consulsions. We presume that dogs are more stressed when cortosol is increased, but the data was inconsistent, for a number of reasons. I would be interested in what the raw data, as imperfect as it is, could tell us. Maybe we could draw conclusions that were not hypothesized. Cindy Martin’s comment about the concept that ‘having dominance over your dog’ equates to ‘the keys to the kingdom’ of obedience really rings true. I guess we need to fight our human nature to get past this. Another great reason to have all people study and understand science! Thanks to a perceptive agility instructor and my brother who suggested your books and the books of Susan Garrett, I have followed the road of positive reinforcement! I believe my relationship with my dog is more fun for us both and certainly less adversarial. I think people try to understand dogs in a way they are familiar with or can easily categorize. It’s easy to say that dogs are domesticated wolves, but this, to me, is like saying people are bonobos. There is a common ancestor, but dogs are not wolves and people are not bonobos. Part of he error lies in the definition of the “pack.” More and more, studies are showing that packs of wolves are not groups ruled by the most aggressive, controlling, or “dominant” male and female, but are a family unit with the parents overseeing their children. Dogs, however, are not wolves and do not form packs. They are highly social, but only form loose, temporary associations. I’m so glad these myths are finally being exposed and coming more and more into the mainstream. the best friends conference was great! trisha you rock! not to take anything away from dr. hetts she is awesome too, minus the microphone malfunctions that certainly caused me to show my fear face a time or two. i learned that yep! i too am stoopid in love with my dogs so help me God and why shouldn’t i be with all that i get from them? i think i am probably stoopid for most dogs. i do so love to see the videos of your dogs and the stories that accompany them. i learned that no matter how many times i read for the love of a dog or see the brilliant tribute to luke – i always have the same reaction – which is to sob uncontrollably as if he were one of my own. this time i thought i would be clever and just not read it. instead i tried to check voicemail messages and read the notes for the next lecture to busy myself and distract my brain, sadly just knowing what is says is enough to bring a flood of tears. i learned that our family joke about momma hugging me TOO much is likely more truth than joke. thanks mom 🙂 i wonder is it possible to have selective oxytocin? i learned that my rottie boy, aspen, in all likelihood has dopamine dysfunction when it comes to food. i learned i am not as over the top with my dogs as others would have me believe. trisha does acupuncture, chinese herbs, organic meats, etc with her dogs too so neener neener! spoiled rotten? abso-freakin-lutely! i think i will put all these points on a tshirt or poster and call it – everything i need to know about dogs i learned from trisha mcconnell. I have a couple of male Great Danes. They are 5 and 6. The one that appears more dominant, 20-30 lbs heavier, is really just more playful. The quiet, seemingly submissive one will step in to any situation and take control if necessary. He knows that he has the power if needed and I’m thinking that is why he rarely exerts it. The best part of the lecture was lsitening to Suzanne talk about the applications of Dominace Theory -from walking through doorways first, to spitting in your dogs food, while 200 trainers laughed hysterically at the ludicrousness of some of these! Wish I had that on tape! What was the one you added, Tricia – the dog “pretending” to be submissive by rolling on its back so it could manipulate the humans? Good grief! Is another underlying assumption about dominance that humans must always determine the terms of the relationship? I like the approach that humans should be the source of all good things to a dog. But I also try to be mindful of the gifts dogs bring to me–attentiveness to the world around us, curiosity, movement. To me the biggest problem with viewing my dog through the framework of dominance is that I’m missing out on relationship. I think the dominance framework is a step along the continuum toward understanding dogs for who they really are. But I sure hope the general public can move beyond it soon and find new ways of understanding dogs. Thanks for sharing this summary. I wish I could have heard the talk. The more I read, the more it seems dogs with owners that buy into this theory are caught in Catch 22. If they don’t automatically understand what the owner is trying to tell them, they are “dominant”, and all the weird and wonderful things humans do to “gain dominance” come into play. If they still don’t get it (unsurprisingly, as often there is no improvement in communication), they are VERY dominant, and things escalate. If they do manage to puzzle it out, then the owner believes they have been proved right, and continue to “dominate”. The whole thing clearly appeals to something very deep-seated in many humans, for them to cling to such an inefficient and ineffective paradigm, when there are simpler, easier and far more effective methods that have been proven to work. I seem to recall a piece of research (I think in Portugal?) that found dominance and punishment were completely ineffective with the dogs being studied, and drew the conclusion that the dogs in the cohort had to be atypical in some way … Sigh. Your point is well taken-dogs are not wolves and one cannot expect that the tendencies of one will necessarily translate to the other. That said, however, I would object to your analogy-despite the very real, substantive differences created by thousands of generations of selective breeding, wolves and dogs are fundamentally the same species. Unlike humans and bonobos who share an ancestor, (MILLIONS of years back, in contrast to the paltry twelve thousand or so since the beginnings of the dog) it’s my understanding that wolves ARE the direct ancestor of the domestic dog. Especially given the physical and behavioral differences between one type of dog and the next (toys, hounds, herders, guardians, etc.) it makes much more sense to think of dogs as being in the same category as wolves than it does to think of humans being in the same category as chimpanzees. I would also note that while it’s a touchier situation than dealing with the family labrador, I HAVE known people who have had occasion to take a bone away from a wolf (captive bred)and who did so with less difficulty (though much more care) than many people I know would have in taking a bone from their dogs. I never have and would never, ever, ever advocate that people should keep wolves or wolf hybrids as pets-they ARE different from dogs, and potentially very dangerous, but people do. And in most ways wolves raised like dogs DO act pretty much like dogs. Ok, I don’t really know what my point is anymore…I meant to say that I appreciate the effort to clarify and understand the concept of dominance and I especially appreciate the effort to differentiate the useful elements of the concept from the meaningless gestures and harsh intimidation employed by people who misunderstand the term. I think its doubly important to get a grip on this because there are occasions in which I need my dog to obey whether he wants to or not, whether he wants a reward or not. Times when I need him to do something (or not do it, more likely) ‘because I say so’. I love training with positive reinforcement, but I think there must be a place set aside for understanding the role of authority, leadership, and respect in the human-dog relationship. All the more so because this role is so often and so badly misunderstood. Thanks for the summary Trisha! To em: I think you’d be gratified to know that all the behaviorists at BFF agree with you that positive reinforcement should be the mainstay of all of our training, but that it isn’t always enough. Just more information that supports that the issue is not amenable to black and white discussions. There are lots of colors in between. So many fascinating points of view! I especially like Frances’s description of the typical “dominance training” Catch-22 that is played out between so many dogs and owners. As a somewhat novice dog owner myself, I’m so glad that a) I stumbled upon a really sweet and temperamentally stable adult dog and b) when I did need some behavioral advice, I was able to find a really great, well-informed and temperamentally stable positive-reinforcement and relationship-based trainer. Of course, in the interest of full disclosure, I’m so far from perfect in my “training style” that I shouldn’t even be allowed to comment on discussions like this. Fortunately, my dog seems endowed with an endless well of love and forgiveness toward me, so I continue to muddle along and hope I don’t do anything to chip away at her resilience. Thank heavens for that endless well; I’m convinced that that’s the REAL reasons why we humans keep up our relationship with dogs–they’re the only other members of the animal kingdom who’ll tolerate US! Trisha, I would like to know your opion of resource guarding and status. Are they corrolated at all, some of the time, or not at all. I have met both confident guarders and insecure ones. Is this confidence a learned behavior from success? Em, I completely dissagree with your statement “And in most ways wolves raised like dogs DO act pretty much like dogs”. I have interacted with captive, hand raised wolves and there is no mistaking the difference. These are wolves that were socialized to humans far more than your average dog, otherwise they would not have the relationship they do. This relationship is nothing like your average healthy human-dog realtionship, nor should it be. I agreee that leadership is important, for some more than others, like humans, for varing reasons. Trisha, loved your “doninance” series, have it printed out for reference.